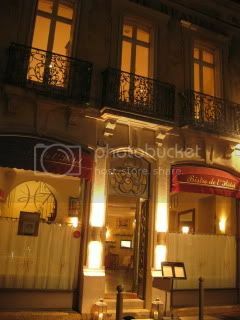 Our final dinner in Bourgogne was at Bistro de l’Hotel in Beaune. 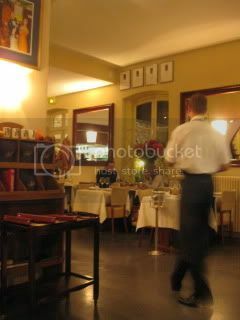 The look of the restaurant and service is quite formal, yet this restaurant has a nice relaxing ambience. This is a popular restaurant among local winemakers, and they come casually. 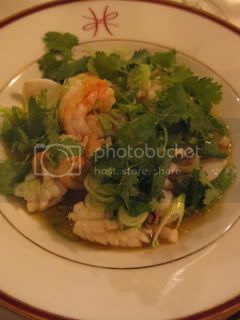 After the amuse-bouche (veloute de celeriac), I started with Fricase de Langoustines, Encornets, Coriandre et Piment (sauté of prawn and squid, with cilantro and pepper). 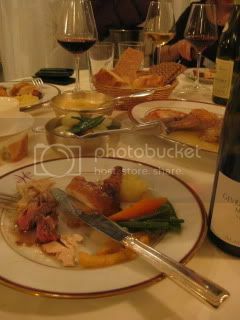 It was a nice fresh-flavored dish, and I was happy that the preparation was quite light. 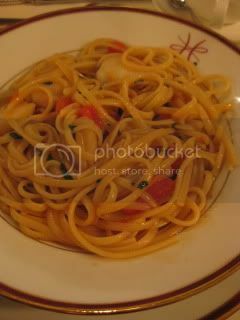 One of my friend’s Scallop linguine was nice, too. 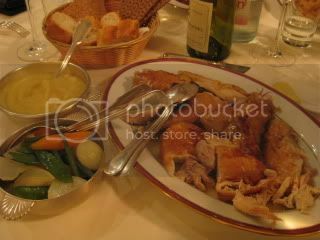 My main course was Poulet de Bresse Roti de chez Mieral, Puree Maison (“Bresse” chicken roast with vegetables) for 2. This was the dish I was so excited about tasting at this restaurant! 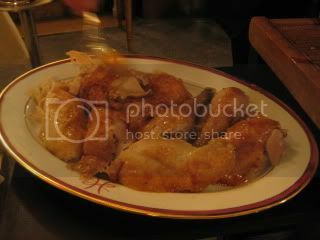 Bresse chicken is a AOC breed and it is a regional specialty in Bourgogne. I was happy to see the blue feet! 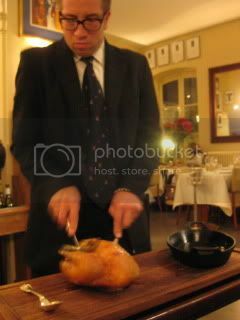 Our server sliced the juicy chicken so elegantly and efficiently. 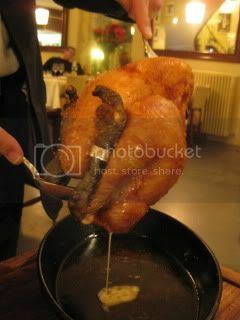 Then, all the au jus were poured over the chicken. Decadent! 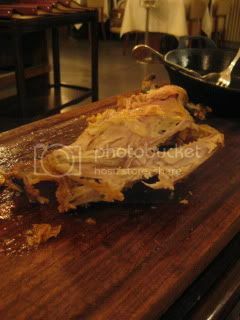 Even the carcasses looked so nice...I wanted to make stock with it! Voila. 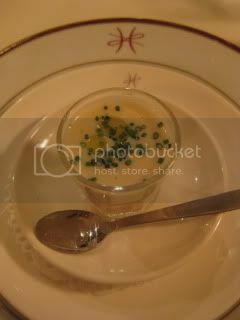 The chicken was served with potato puree and vegetable glasse. 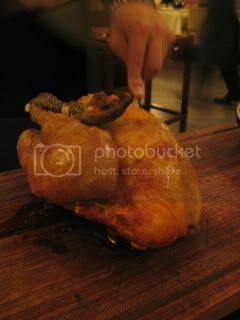 The flavor of the chicken was exactly I was expected and it was so gorgeous. And, I truly enjoyed the “natural” bite in the texture. Gorgeous. 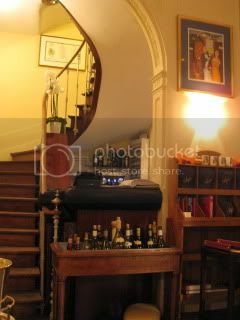 Wines were nice, too. 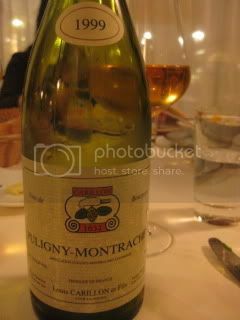 1999 Louis Carillon, Puligny-Montrachet…orange/ amber color, hazelnut and butter in the nose. Fresh acidity, minerals, spice, lime, and earthiness on the palate. Long finish. 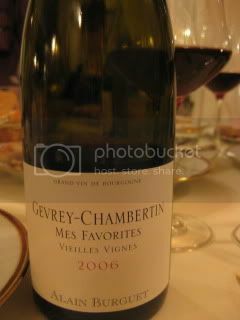 2006 Alain Burguet, Gevrey-Chambertin “Mes Favorites”…bright ruby color, spice, berry, and flower. Dark berry, smooth palate with acidity. 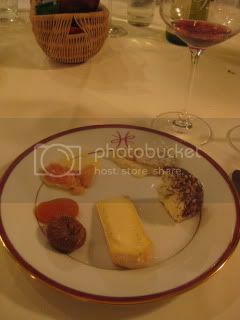 Cheese course included Epoisse, Citoux, Tarte du Poiset (local goat with white rind), and Delice de Pommard (triple-cream cows milk cheese, blended with brown mustard seeds). 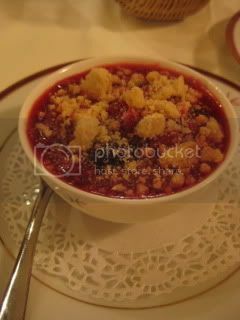 And, the dessert was Framboise Panna Cotta. The chef came to our table and we chatted a little bit. He is originally fro Sweden and had lived in France for over 30 years. 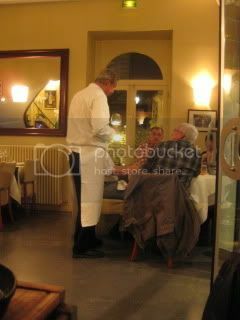 He said he has never worked in Italy, but Italy is his favorite country to visit and loves the food. So, that was his inspiration!